Wouldn't you like to photograph lions and tigers? Instead of going on a safari, join us at Big Cat Habitat—a sanctuary for rescued exotic animals. During the first hour, we'll photograph some of the wide variety of animals cared for at the Habitat, including bears, tortoises, primates, and birds. 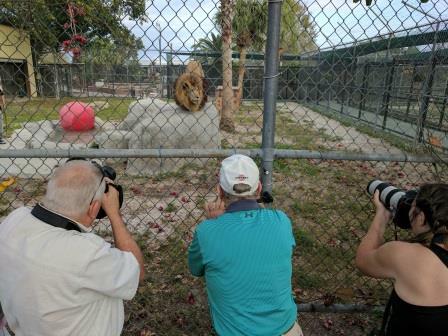 In the second hour, we'll photograph lions and tigers inside the perimeter fence. Instead of shooting through two fences, you'll aim your camera through the openings of the chain-link fence, so there won’t be a fence in your photographs. For more information go to: www.sarasotaphotolessons.com/Big_Cat_Habitat_Photography_Tips.